We're all guilty of it: writing in the margins. Strictly speaking, marginalia are words written into the margins of books or archival papers. 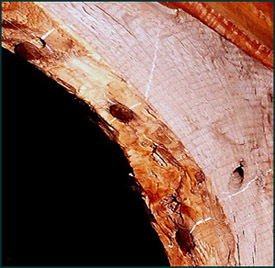 These 'scribbles' are often intriguing traces of the living, breathing beings who handled the material before us. This also sometimes happens to artifacts. Let me show you some objects from the collection that have been marked up in various ways. 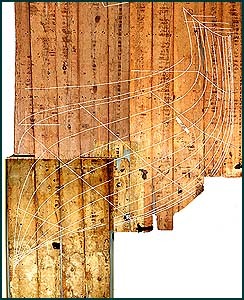 Navigational instruments that reside in boxes seem particularly prone to marginalia, given that the blank wooden surfaces were immediately at hand just at the moment when a particular bearing or fix needed to be remembered. On the lid of this ca. 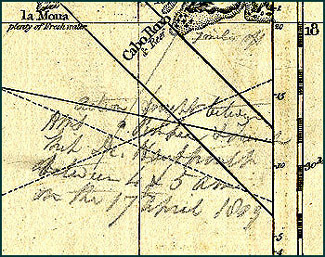 1823 polaris-type compass: "On testing my compass 21 June 1845 with County Meridian find it to be 16 degrees of variation from it W.ly"
That was probably worth noting. 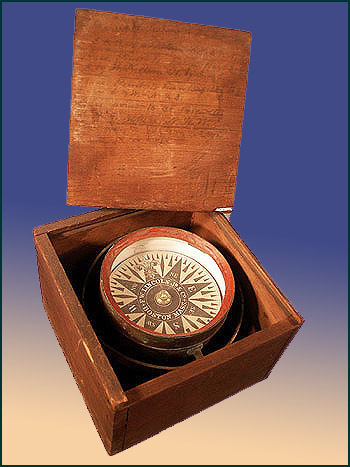 The lid to this dry compass has several bearings out and back noted for quick reference, e.g. "Bass Point to Town Bar Buoy S by W 1/2 W Return N by E 1/2 E ". 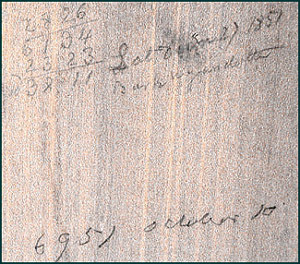 "38 [degrees] 11 [minutes] Lat[itude] June 27, 1851 Bark Wyandotte"
"69 [degrees] 51 [minutes] October 10"
Of course, we don't know if these figures are even from the same voyage, but for whatever reason, these two random positions were noted on the case lid, presumably before being recorded in a logbook. Wyandotte was a local Maine vessel; at 107 feet in length and 257 tons burden, she was built up the river from Bath in 1848, a moderately-sized vessel from the moderately-sized town of Dresden. She was just about the largest vessel that the Houdlette yard could squeeze into the Kennebec. Sometimes the instrument case was too far away, left back down in the cabin. The highlighted square area at the upper end of this ca. 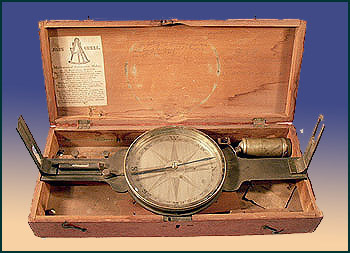 1850 octant reveals the navigational arithmetic of Winterport captain George Dudley. Though not exactly a navigational device, this souvenir fan from London's renowned Trocadero restaurant provides a kind of 'fix', nonetheless. 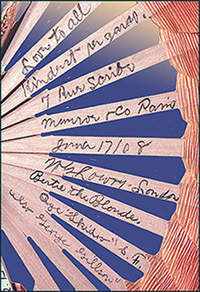 The backs of the pink spines were signed and dated, perhaps during one evening's dining party in the Edwardian elegance of a new century as yet unshattered by World War I. From the top down, "Love to all, Kindest regards, 7 Rue Scribe [? ], Munroe [?] Paris, [June?] 17/08, [name] London, Bertie the Blonde, Age 'Skidoo' S.F., also George Gillson". Of course, this is at best an intriguing code that we can only partially decipher, as if eavesdropping from the adjacent table. 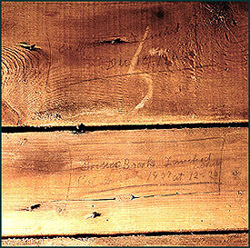 The bottom note reads, "Governor Brooks launched Oct. 22, 1907 at 12:20 o'clock". A five master, the Brooks did well to survive the numerous U-boat sinkings of World War I; she went down off Montevideo in 1921. 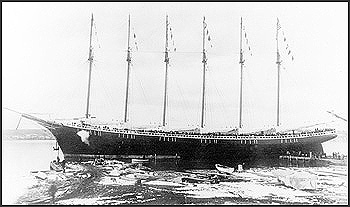 The top note reads, " Six Master Launched Dec.1 1906". 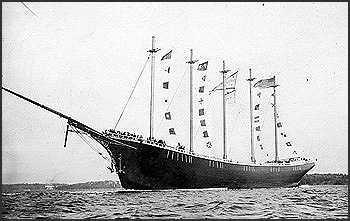 This was to be the big Alice M. Lawrence, which only eight years later would come to ruin on Tuckernuck Shoal south of Cape Cod. Note the December river ice. Some marks left behind are not so clearly documentary, but nevertheless record brief glimpses of otherwise unknown or largely forgotten moments. 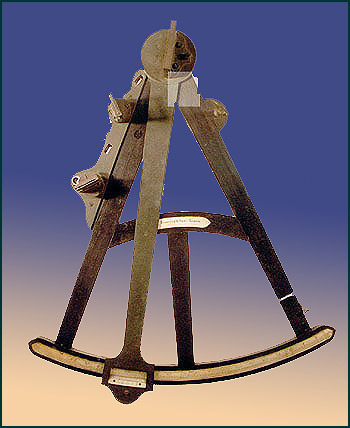 The knee (below) is one of many that strengthen the frame of the Joiner Shop at Percy & Small. 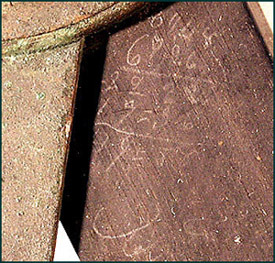 Adjacent to the head of each iron fastening on the curved face of the knee can just be discerned a white chalk mark, where, in 1899, a shipyard carpenter decided where to drill his next holes. Though not strictly on an artifact, I can't resist showing this classic bit of marginalia. In an obscure corner of our 1794, London published, The West Indian Atlas, I noticed these words (above) next to a plotted position mark, as they note, 7 miles off Cabo Roxo, (south-western Puerto Rico): "Action fought between HMS Pompe'e and French ship D'Hautpoult between 4 & 5 am on the 17 April, 1809". As it turns out, these few dry words belie a rather complicated multi-day, multiple ship involvement that was a spin-off of what the victors (English) euphemistically called the 'Reduction of Martinique' (French), in January of 1809. The subsequent shifting of Caribbean sea control found the brand new, newly arrived D'Hautpoult(74 guns) and her squadron being dogged through the night by a much smaller English 'cruizer' until HMS Pompe'e (also 74) and her accompanying frigate were able to come up and, after considerable mutual 'reduction', force a French surrender. Was this chart volume aboard Pompe'e that night? Or was our notation simply a naval reference added later in another place? 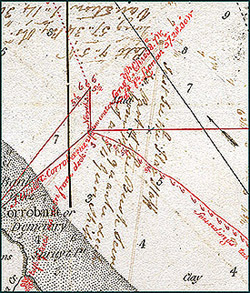 Other pages of the same Atlas have detailed courses, soundings, and annotations (see below) added in a way that suggests its immediate use, so the question remains open. "A tower squared for 60 feet high & flagstaff 30 feet high, the only Remarkable object on this coast" runs one of the notes. A different observation in a different hand,"Tuft of trees as seen from deck". In yet a third hand, "Just see the Flagstaff", for one position; for another, "Part of the Bush seen from the quarter deck of a 74 Gun Ship". 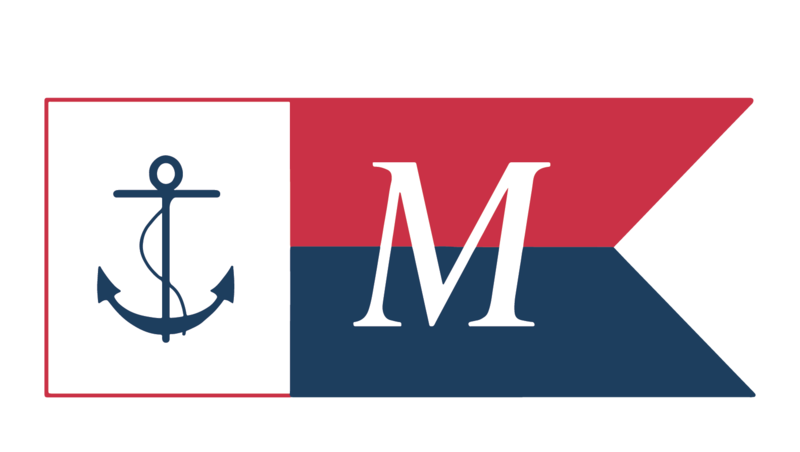 Perhaps this is a set of navigational/surveying exercises for the ship's midshipmen. Though not exactly marginalia, my piece de resistance is akin, in that it is pencil marks made on a surface used primarily in another way. 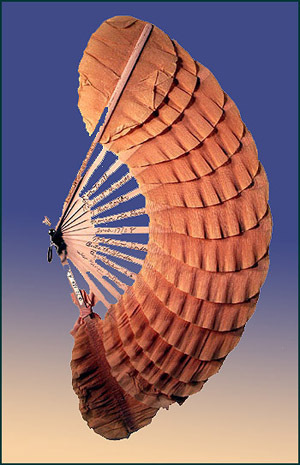 It is also one of the most ungainly artifacts in the collection, one of the most difficult to display, and even if it were, which it never has been, one would still not be able to clearly see the point of it all. 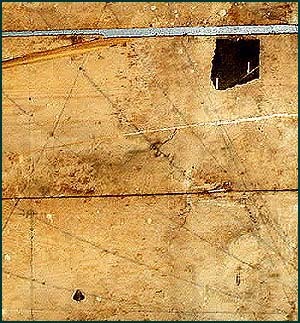 Seen here for the first time, digitally re-assembled and enhanced, is a section of the sub-floor of a small room in Bath upon which was lofted a a full size vessel. Although the lofting was rumored to exist, it was not until the building was slated for demolition that we were able to peel back the wall-to-wall carpet, cut away an oak finish floor to indeed reveal the faint but unmistakable curves penciled on the rough-sawn sub-floor. 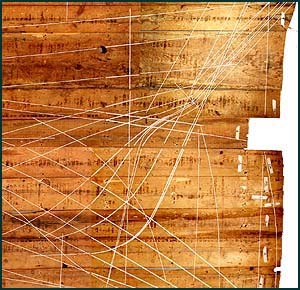 Three days of salvage work, which included partial removal of an interior wall that had been constructed across one end of the lofting, brought the 12' x 18' floor drawing to light. 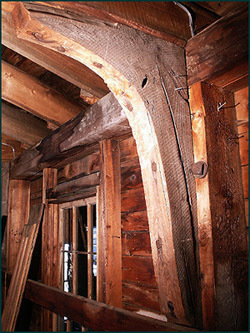 The aged floorboards were carefully cut loose and sequestered in the Museum basement; the house was demolished within the week. 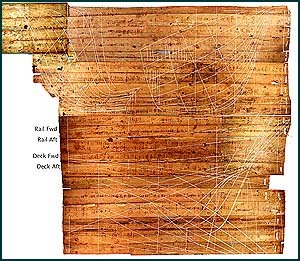 A closer view shows how the profile lines of the stern half of the vessel were drawn over the forward half in order to fit into the small room, creating an initially confusing tangle of curves. 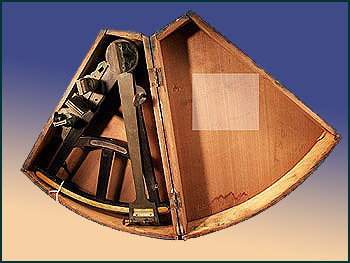 The end-view lines of the stern half of the vessel can be seen here (above), including the transom. 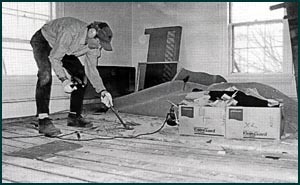 The black patch is a bit of tarpaper with two staples that was laid down over the lofting in 1966, when the finish floor was installed. The house was originally built in 1866, so we have a hundred year date "window". There is only a rumor that the vessel was built, but given the trouble and care that lofting in a confined attic space entails, it seems that there were serious intentions. From a northern Maine roadside somewhere west of Mt. Katahdin, this sign has been carved in, autographed, and otherwise well scrawled on. Reading between the lines, "We had a hard night last night!! 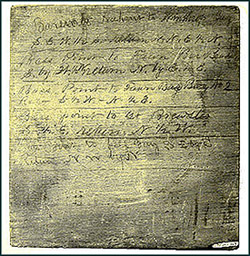 Aug. [rest of date obscured]". And perhaps you have, too.